This seemed like a good idea. 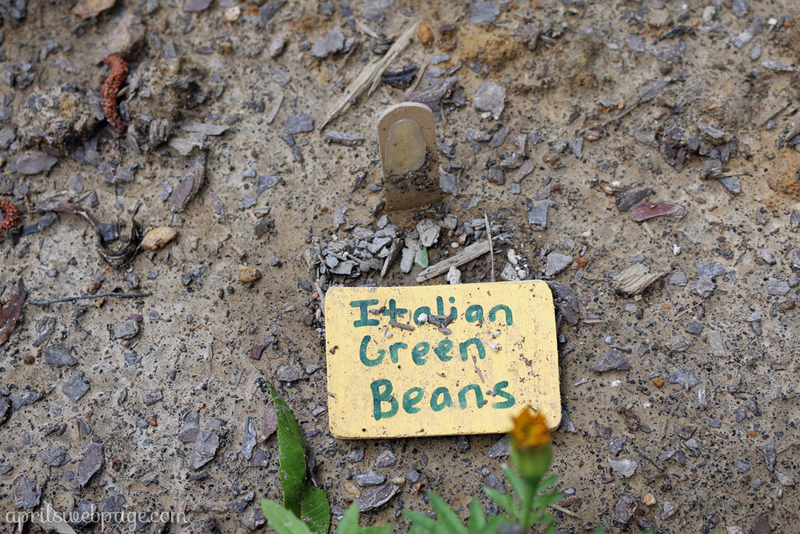 I was looking for a more creative way to display what was planted in the garden so I wouldn’t have to use the little plastic tags that come with the vegetable plants. I came across the idea to use popsicle sticks and small wooden signs on Food & Photography‘s website. I got the popsicle sticks and the small wooden signs at Michael’s. 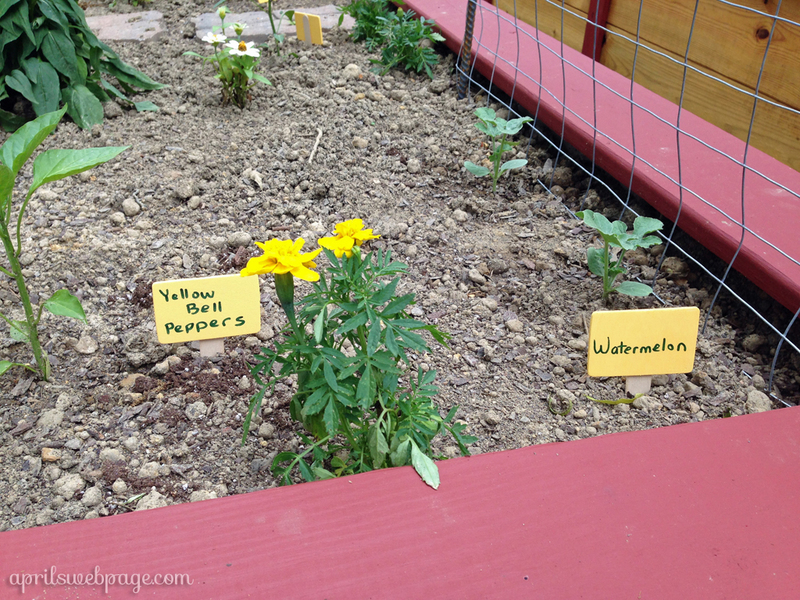 I used outdoor acyclic paint to paint the signs yellow, and then I used a paint marker to write the names of the vegetables. I then hot-glued the signs to the popsicle sticks and waited 72 hours per the instructions on the paint. I originally wanted to stencil the lettering onto the signs, but that would have been too time-consuming, and some of the words were too long for that. I thought they looked cute, but that didn’t last long. They are falling apart. Literally. The signs are coming off the popsicle sticks. The signs are also splitting length-wise, and there are some in which I could probably peel a layer off. They’re also getting splattered with dirt when it rains, so they’re not so pretty anymore. 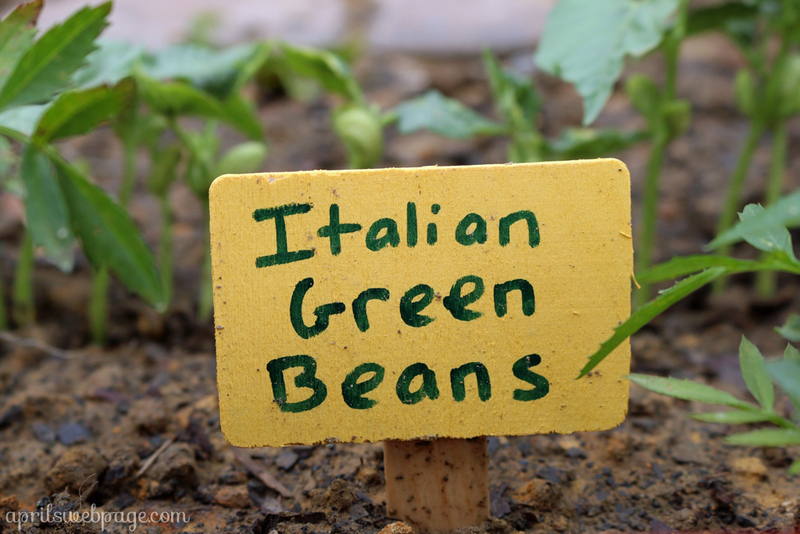 I put the signs in the garden on June 2nd. It was only a matter of days before the first sign fell off a popsicle stick. I’m still really new to the crafting world, especially with wood. I have done a LOT of Google searches in the past week, and there are two things I should have done differently with this project. 1) Once I finished painting the wooden signs, I should have sealed it with something. This is probably common knowledge to many that do crafts for outdoors, but I didn’t really think about it needing something. 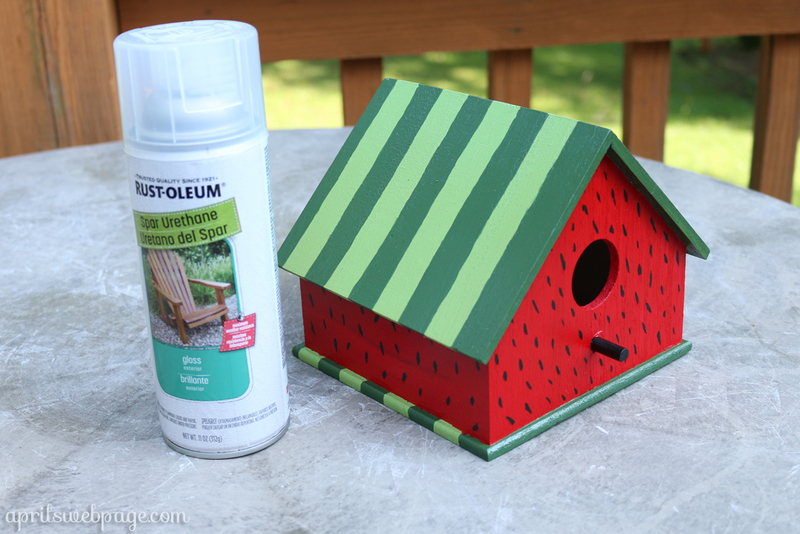 I still hadn’t attached the birdhouse I’d painted for the garden, so I did research to find out what to use so I wouldn’t have the same thing happen to my birdhouse. I decided to go with spar urethane for maximum protection. Michael’s had this in the wood craft section for $14.99 a can. 2) Use wood glue instead of a hot glue gun. Hot glue gets cool and bonds the 2 pieces of wood. The hot sun makes the glue pliable again, and the signs loosen or fall off. 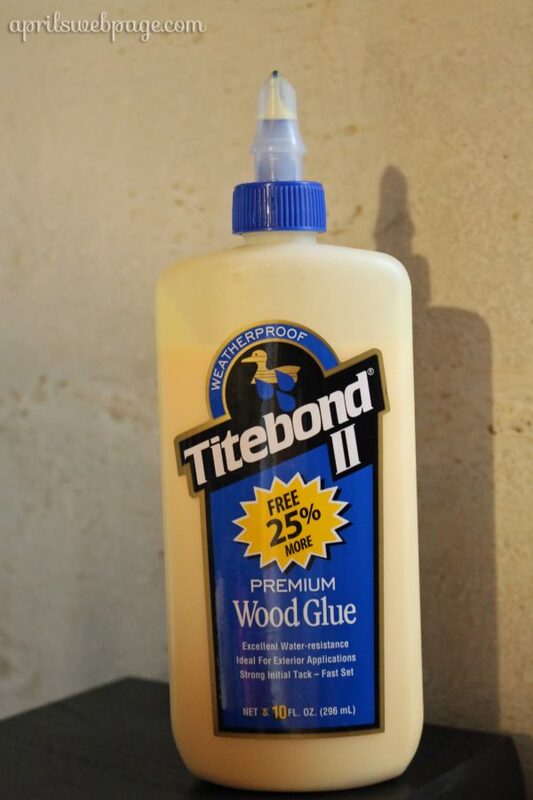 I started on another project in which I needed some wood glue, and I picked up some Titebond II weatherproof wood glue at Lowe’s – and I LOOOOOOOVE it! I didn’t have this at the time I was doing these signs, but this is what I should have used rather than hot glue. 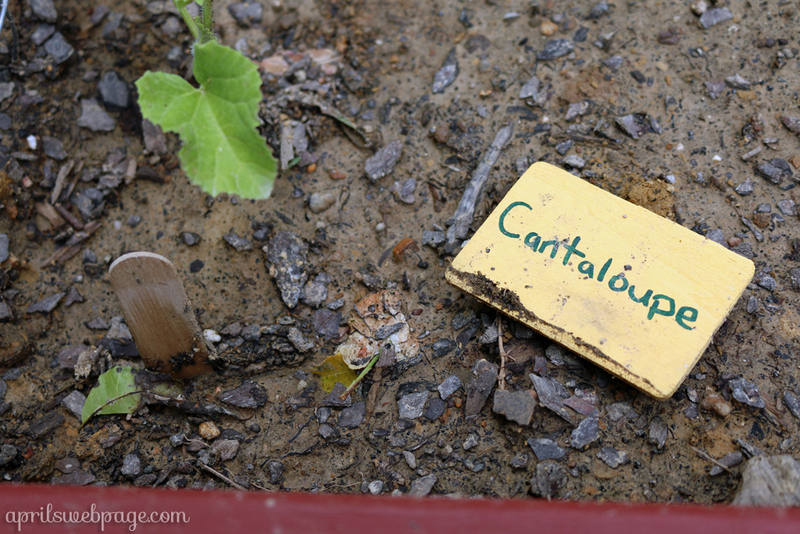 With next year’s garden, I might put down some mulch so the dirt splatter doesn’t make the signs so dirty. I need to look more into this though because it seems I remember coming across a posting somewhere where someone advised against mulch because it encourages disease. If that’s the case, I’ll skip the mulch and figure out another solution for the signs. As for this year, I might get around to doing new signs, but it seems rather pointless when I pretty much know what everything is.